The material composition and engineering of doors and frames are crucial for door openings looking to achieve a high level sound transmission class (STC) rating. These components generally get the most attention when specifying an opening with focus on things like insulation and what core material to use. Accessories such as sound seals are often overlooked, but they play a huge role in the opening’s performance. The door and frame sound abatement properties are only effective if there is a proper seal when the door is in the closed position. Just as seal kits for your oven or refrigerator impact the thermal performance of those appliances, acoustic seal kits play a similar role in the operation of STC door openings. For higher level STC ratings, two types of seals are primarily used: adhesive and compression. Understanding the advantages and limitations of each will help you know which perimeter seal should be used for specific applications. Adhesive seals are more common as they fit standard frame designs and are utilized for lower ranges of STC ratings as well. Generally, adhesive seals can achieve up to an STC 52 rating when used with a 1-3/4” thick door, though that figure may vary slightly depending on manufacturers’ test data. As the name suggests, adhesive seals stick into place which eases installation. This method provides a fixed placement of the seals with very limited adjustability after installation. Some modifications may be necessary to accommodate certain types of hardware, such as electric strikes. It is best to make these adjustments at the time the hardware is installed. Since they are compatible with standard frames, adhesive seals are a good, cost-effective option to retrofit existing openings to increase their sound containment. Adhesive seals are also available as GREENGUARD certified, which may help to qualify for certain projects as it improves air quality while promoting sustainability, health and safety. Compression seals can achieve higher STC ratings than adhesive, up to 54 with 1-3/4” doors and higher (up to STC 66) if used in communicating openings such as the Ceco Sound-Tech Xpress+, Curries Quiet Noise+ or Fleming Whisper Core+ offered from ASSA ABLOY. 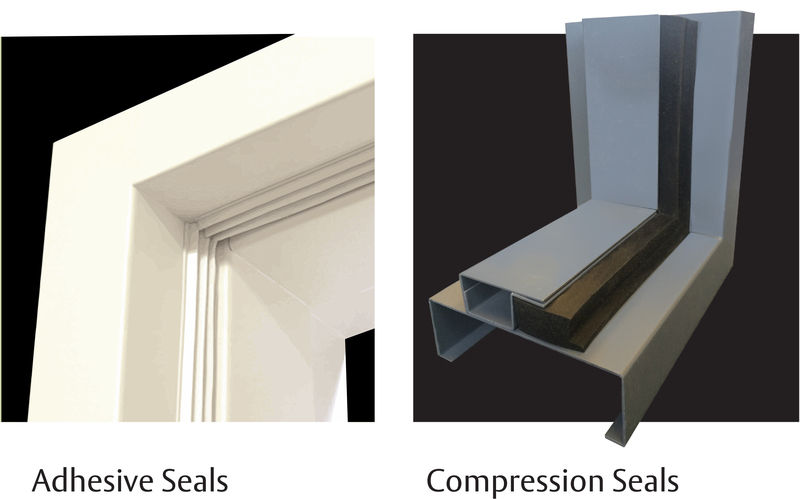 Compression seals fit into a cavity engineered into the door stop of the frame, limiting their use to custom acoustical frames with cam-lift hinges. This design element allows for further adjustability to accommodate field conditions compared to adhesive seals, although this does require a higher level of installation knowledge. Aesthetics is an important consideration when determining what type of product is used. If the required STC rating can be achieved with both seal types, you should determine if you want the opening to resemble a standard opening or have a more industrial look. Adhesive seals allow you to match other openings on a job very closely. They can be applied to standard frames and used with standard hinges. In contrast, the thickness of the compression seal and the larger door stop profile creates a more industrial look than that of a standard frame. Additionally, robust cam-lift hinges are required with this system to compress the seal when the door closes. So next time you’re walking through a door, check out the seals. They can tell you a lot about the opening. If you’re having trouble with noise in a particular room, look into upgrading the seal system as a simple solution. Congruent to this blog, Ceco and Curries have published a quick reference sheet outlining the two acoustic seal options.